Found in mountainous regions and tundra as far north as the Arctic, golden root has benefits similar in many ways to ginseng. A key remedy for long-term stress and physical and mental fatigue, it supports the body's stress response. 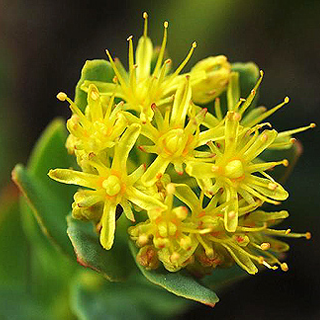 Rhodiola rosea is a valuable endurance herb that helps the body and mind adapt efficiently to increased physical and mental demands. It can be valuable in depleted states such as chronic fatigue and nervous exhaustion, although care should be taken to start at a low dose and increase it slowly. Even though golden root does not as yet have established antidepressant activity, it does appear to help raise mood and vitality in those who have a tendency to suffer from depression. It combines well with Ginseng (Panax ginseng). Take at the manufacturer's recommended dosage. Take product at manufacturer's recommended dosage. Growing from seed can be difficult, because the dried seeds have a low germination capacity. However, this can be improved if, prior to planting, the seeds are stored in moist sand in cool conditions for about a month. Rhodiola Rosea can also be propagated by root division. A minimum of 5 years must pass before the medicinal roots can be harvested. Harvest in autumn by digging out the roots by hand.